This young guy is looking forward to the GRAND OPENING of the renovated Boys House 1, which gives over 200 orphans a new standard of living! This house will be the first bedroom with real beds and mattress, pillows and blankets! The 100 x 8 meter 2 floor house has been fully renovated and got new color inside and outside. Broken windows had been changed, toilet facilities changed and renovated… more than 3 Mio Thai Bath for a better life! We would like to invite all 2400 orphans for a dinner on the Grand Opening Sunday this week – but a sponsor for 27.000 THB is needed. 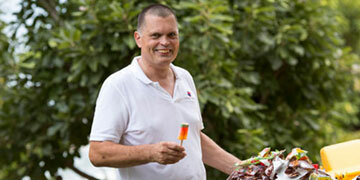 The icecreme for desert is ordered already – thanks to Gerhard! Anyone out there who wants to help us? 3 hours after publishing our needs, Michael from Berlin sponsored the opening lunch already. 2440 likes and thanks to you!